Transoesophageal Echocardiography (TEE) is now an integral part of practice of cardiac anaesthesiology. Advances in instrumentation and the information that can be obtained from the TEE examination has proceeded at a breath-taking pace since the introduction of this technology in the early 1980s. Recognizing the importance of TEE in the management of surgical patients, the American Societies of Anesthesiologists (ASA) and the Society of Cardiac Anesthesiologists, USA (SCA) published practice guidelines for the clinical application of perioperative TEE in 1996. On a similar pattern, Indian Association of Cardiac Anaesthesiologists (IACTA) has taken the task of putting forth guidelines for transesophageal echocardiography (TEE) to standardize practice across the country. This review assesses the risks and benefits of TEE for several indications or clinical scenarios. The indications for this review were drawn from common applications or anticipated uses as well as current clinical practice guidelines published by various society practicing Cardiac Anaesthesia and cardiology . Based on the input received, it was determined that the most important parts of the TEE examination could be displayed in a set of 20 cross sectional imaging planes. These 20 cross sections would provide also the format for digital acquisition and storage of a comprehensive TEE examination. Because variability exists in the precise anatomic orientation between the heart and the esophagus in individual patients, an attempt was made to provide specific criteria based on identifiable anatomic landmarks to improve the reproducibility and consistency of image acquisition for each of the standard cross sections. The IACTA guideline committee acknowledges that it followed the international guidelines, especially the ASE and SCA principles wherever necessary and modified the strategy to suit local requirements. Perioperative transesophageal echocardiography (TEE) is a diagnostic and monitoring imaging tool with widespread applications in the operating rooms and intensive care settings. This modality is being used in both government institutions and private hospitals all across India. In view of increasing application of TEE in Indian context, it has become imperative to establish protocol/guidelines for the practice of TEE. This document is expected to assist physicians to help appropriate application of TEE and improve the perioperative management of surgical patients. These recommendations may be adapted and modified according to the local institutional policies, circumstances and expertise; and are not intended to be absolute regulatory requirements. Further, these recommendations are subject to the availability of TEE facility in a given hospital and its availability is not binding for carrying out surgical procedures [Table 1]. The guidelines do not address training, certification, establishing credentials and quality assurance. It is recommended to have an electrocardiogram trace on the echocardiographic imaging screen. "Advancing:" pushing the tip of the probe distally into the esophagus or the stomach; "withdrawing:" pulling the tip in the opposite direction proximally; "turning to the right;" rotating the anterior aspect of the probe clockwise within the esophagus toward the patient's right; "turning to the left:" rotating the probe counterclockwise. Flexing the tip of the probe anteriorly with the large control wheel is called "anteflexing" and flexing it posteriorly is called "retroflexing." Flexing the tip of the probe to the patient's right with the small control wheel is called "flexing to the right," and flexing it to the patient's left is called "flexing to the left." Finally, axial rotation of the multiplane angle from 0° toward 180° is called "rotating forward," and rotating in the opposite direction toward 0° is called "rotating back." The images displayed at the top of the screen are in the near field and structures in the far field are at the bottom of the screen. At a multiplane angle of 0° (the horizontal or transverse plane), with the imaging plane directed anteriorly from the esophagus through the heart, the patient's right side appears in the left of the image display and vice versa. Rotating the multiplane angle forward from 0° to 90° moves the left side of the display inferiorly (caudad) and right side of the display superiorly (cephalad). Rotating the multiplane angle to 180° places the patient's right side to the right of the display, will be a mirror image of 0°. Approximately distance of the probe tip from lips is 20-25 cm for upper esophageal (UE) views, 30-40 cm for midesophageal (ME) views and 40-45 cm for transgastric (TG) view in an average sized adult male; however, placement of the transducer into desired location is primarily accomplished by waiting the image to develop as the probe is manipulated rather than depth markers on the probe. From base to the apex, the LV is divided into basal, mid and apical thirds corresponding to the proximal, middle and apical segments of the coronary arteries. 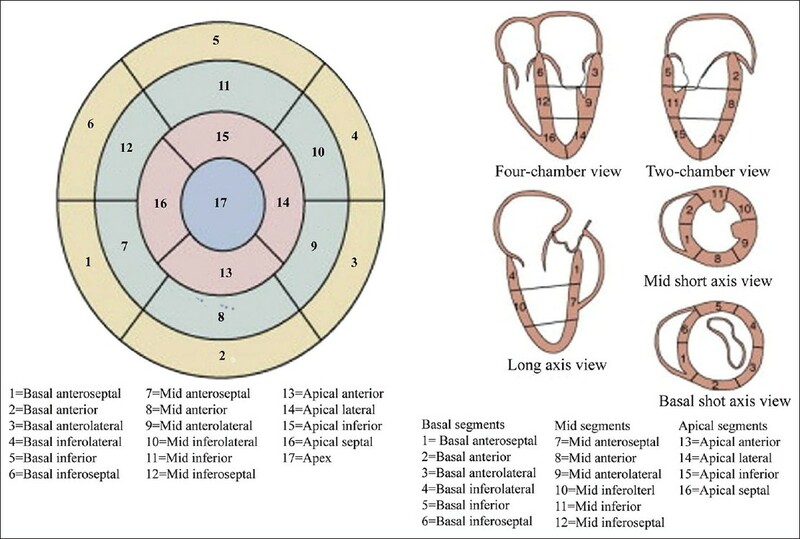 The scheme divides the ventricle into 17 segments [Figure 27], six segments both in the basal and mid portions (anteroseptal, inferoseptal, anterior, anterolateral, inferolateral and inferior walls) and five at the apex (septal, anterior, lateral, inferior and apical). As these segments can be recorded from three SAX and several longitudinal views, it is possible (and useful) to evaluate a segment from more than one view [Figure 27]. The authors are deeply indebted to Dr. Navin C Nanda and Dr. PK Neema for making valuable suggestions in writing of this manuscript. 1. Oh JK, Seward JB, Tajik AF. Transesophageal echocardiography. In: The Echo Manual. 2 nd ed. Philadelphia: Lippincott-Raven; 1999. p. 3-36. 2. American Society of Anesthesiologists and Society of Cardiovascular Anesthesiologists Task Force on Transesophageal Echocardiography. 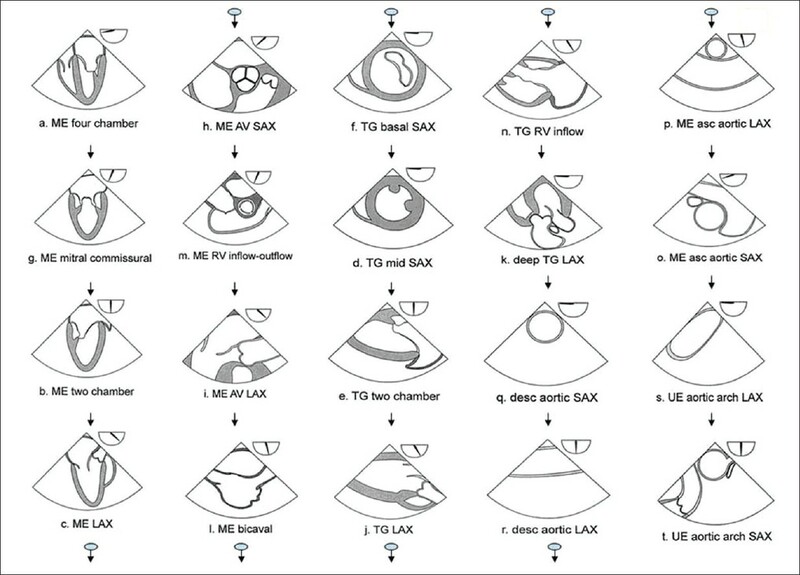 Practice guidelines for perioperative transesophageal echocardiography. An updated report by the American society of anesthesiologists and the society of cardiovascular anesthesiologists task force on transesophageal echocardiography. Anesthesiology 2010;112:1084-96. 3. Kanchi M. A category I indication for transesophageal echocardiography. J Cardiothorac Vasc Anesth 2011;25:206-7. 4. Na S, Kim CS, Kim JY, Cho JS, Kim KJ. Rigid laryngoscope-assisted insertion of transesophageal echocardiography probe reduces oropharyngeal mucosal injury in anesthetized patients. Anesthesiology 2009;110:38-40. 5. Côté G, Denault A. Transesophageal echocardiography-related complications. Can J Anaesth 2008;55:622-47. 6. Mathur SK, Singh P. Transoesophageal echocardiography related complications. Indian J Anaesth 2009;53:567-74. 7. Shanewise JS, Cheung AT, Aronson S, Stewart WJ, Weiss RL, Mark JB, et al. 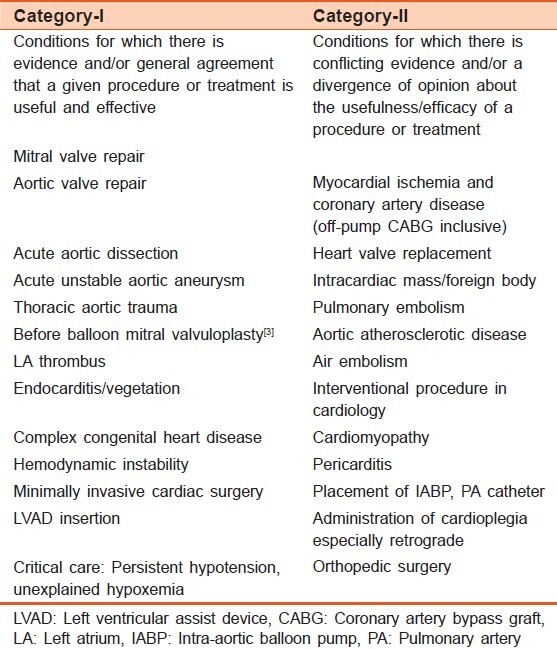 ASE/SCA guidelines for performing a comprehensive intraoperative multiplane transesophageal echocardiography examination: Recommendations of the American society of echocardiography council for Intraoperative echocardiography and the society of cardiovascular anesthesiologists task force for certification in perioperative transesophageal echocardiography. Anesth Analg 1999;89:870-84. 8. Cerqueira MD, Weissman NJ, Dilsizian V, Jacobs AK, Kaul S, Laskey WK, et al. Standardized myocardial segmentation and nomenclature for tomographic imaging of the heart. A statement for healthcare professionals from the cardiac imaging committee of the council on clinical cardiology of the American heart association. Circulation 2002;105:539-42. 9. Smith JS, Cahalan MK, Benefiel DJ, Byrd BF, Lurz FW, Shapiro WA, et al. Intraoperative detection of myocardial ischemia in high-risk patients: Electrocardiography versus two-dimensional transesophageal echocardiography. Circulation 1985;72:1015-21.